On this episode of Valley’s Gold, host Ryan Jacobsen stops in at the John DeGroot and Son Dairy and visits with 5th generation dairyman, Charlie DeGroot and two of his sons at their farm in Easton, CA. Learn how this dairy keeps its California Cows…happy… and producing many tons of milk for local consumers. And speaking of creamy, dreamy treats…Ryan stops off at the Rosa Brothers Milk Company in Tulare and samples their famous root beer, orange and chocolate milks as well as a unique coconut chocolate ice cream that are all made fresh each week at this family-owned processing plant. Find out where you can pick some up for home. Owner Rene Reynoso of Peluso Cheese in Los Banos takes Ryan on an extensive tour of his facility where many types of cheeses are created. From the fresh milk coming in to the wrapped product heading out across the globe, enjoy a first-hand look at a true Valley treasure. By the time this show is over, we will be ALL MILKED OUT! 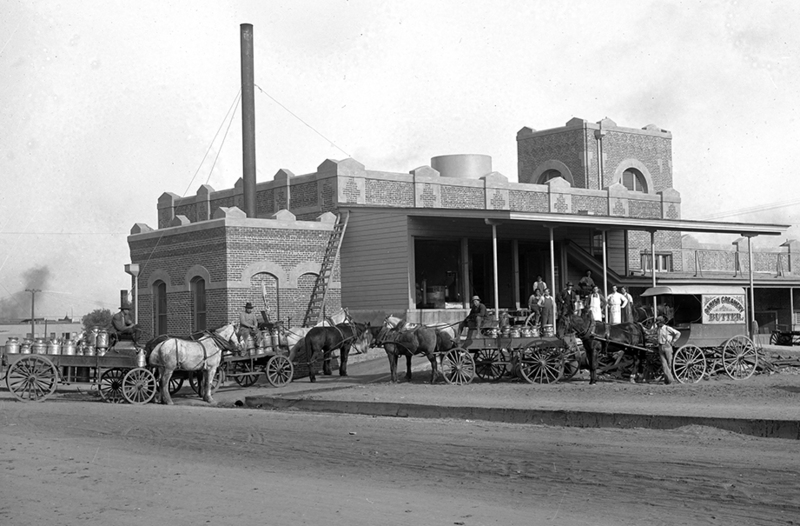 In the 1880s, a number of family-owned and operated dairies supplied Fresno County with dairy products. Noted agriculturist, Minna Eshleman’s scientific butter-making experiments during the late 1880s introduced the creamery industry to the Fresno area. Eshleman’s Minnewawa Creamery Company was the first to produce consistently high quality butter and her methods became the basis for the industry’s statewide standards. The nation’s oldest processing cooperative was established in the mid-1890s by danish immigrants. 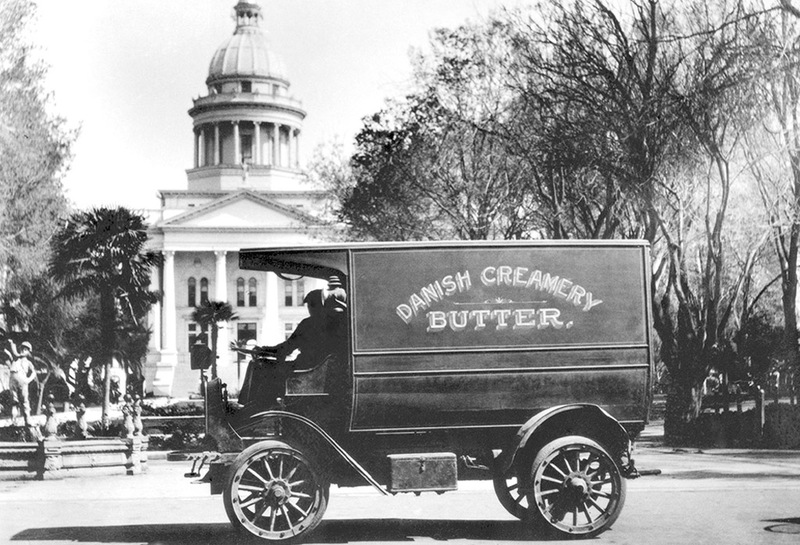 The Danish Creamery Association introduced the Holstein-Friesiean breed into California. The breed remains the primary stock of the local industry today. One of the best known regional ice cream brands during the first decades of the twentieth century was Benham’s, with their plant located in downtown Fresno. By the early 1920s, the Wilson Theatre advertised that their building was cooled by cold air pumped in from the nearby Benham’s ice cream plant! Harpain’s Dairy in Fresno had the distinction of being one of the few privately owned dairies in the United States with the entire operation under one roof – from milking to over-the-counter sales – during the 1930s through the late ’70s. By 1977 when Walter Harpain closed the dairy, Harpain’s was synonymous with glass bottled milk, the best chocolate milk and a favorite of all the children, a petting zoo. Producers Dairy had been building a solid reputation for quality products for twenty years in the Central Valley when, in 1953, the company launched its popular trademark featured on milk cartons – Hopalong Cassidy and his faithful horse, Topper. Several generations of Fresno children have grown up with “Hoppy’s Favorite.” The familiar cowboy figures into a memorable story during Fresno County’s Centennial Celebration in 1956. When William Boyd, the actor who played Hoppy, was selected to appear as grand marshal in the 1956 “Century of Progress” parade, no plans were made to include Topper. Local school children wrote 2,190 letters to Boyd begging him to lead the parade on his horse instead of seated in an automobile. The children’s pleas won the day and arrangements were made to stable Topper at the Fresno Zoo. The thousand children lined the parade route to cheer as Hopalong Cassidy rode the celebrated horse!